This prototypical pair of three bedroom semi-detached houses has been designed and built in Swinton, for Berwickshire Housing Association. 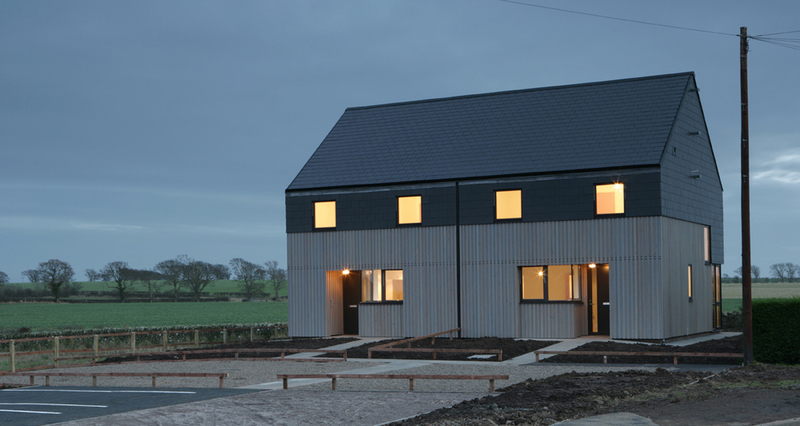 The houses set out to raise the standards of sustainable design in residential developments. Energy conservation methods employed include the collection of solar energy through a whole house ventilation and water heating system, glazed sunspaces and eventually wind energy via small individual turbines. The construction is lightweight and quick to erect. Well insulated breathable timber frame walls are clad in cement fibre slates and timber boarding. The appearance of a simple, archetypal form of a house has been achieved by detailing flush junctions between walls and roof pitches, recessed rainwater downpipes and discreet details to conceal cavity barriers.